Etisalat has launched a new self-service platform called MyEtisalat. Etisalat NG introduced this service on YouTube Live days ago. MyEtisalat self-service is designed to give customers a quick and friendly user experience. The event began with remarks by the Chief Product and Information Officer, Etisalat Nigeria, Otuyemi Otule, who emphasized the pride of place Etisalat takes in creating customer satisfaction. After that, there was the introduction of My Etisalat platform which is designed to help Etisalat subscribers access all the services and functions provided by Etisalat and also help them resolve most of the issues they may have without the need to call the customer care or the need to text or dial codes. While speaking at the event, Otuyemi noted that “MyEtisalat can be accessed via an app and on the web. The app is available on all major application platforms such as iOS, Android, Blackberry and Windows and is zero-rated, which means customers do not need data to use the application”. Customers can view the package they are subscribed to and also add plans, remove plans or move across plans with the self-service platform. At the click of a button, customers can buy airtime and data with a variety of payment options including their naira debit cards. This is particularly important, as it saves customers the stress of having to hunt for recharge cards especially in an emergency. The app provides security options for customers’ number, so if they lose their device, customers can easily MyEtisalat self-service to block their numbers remotely. Etisalat customers can manage several numbers with the same app. This makes airtime transfer and data transfer much easier. 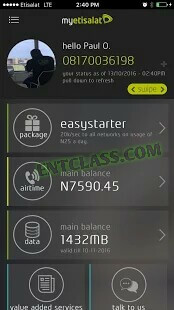 MyEtisalat makes it easier to monitor airtime and data usage. MyEtisalat can be accessed both on web and on App. MyEtisalat app is available on Android, iOS, Blackberry and Windows. 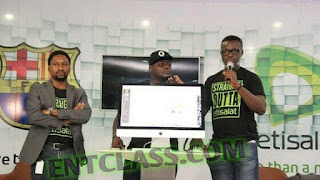 You can visit the web version at My.etisalat.com.ng. With this feature, Etisalat users can now manage their account themselves without the need to call the customer care agent or dial any code. It's a nice one coming from Etisalat and i really welcome this. New improvement from my best Network.